Mindfulness has become a buzz word. It’s a practice being implemented by one quarter of all U.S. companies—including General Mills , Target, Apple, Nike, Procter & Gamble, The Huffington Post and AOL. But what is mindfulness and why does it work? 1. The intentional, accepting and non-judgmental focus of one’s attention on the present moment. 2. The quality or state of being conscious or aware of something. 3. A mental state achieved by focusing one’s awareness on the present moment. Mindfulness: Arriving in a state of powerful presence. Mindfulness is a tool and a pathway to the most powerful state we can operate from: a state free from any self-doubt, second guessing, stress, worry or uncertainty. A place of confidence, certainty, and ability. What it does is enable us to shortcut our way through anything that doesn’t enable the power of presence, by taking us step by step into only what is happening right now. Note that this is not about avoiding thinking ahead or strategic planning—but it’s about doing that with presence and power. 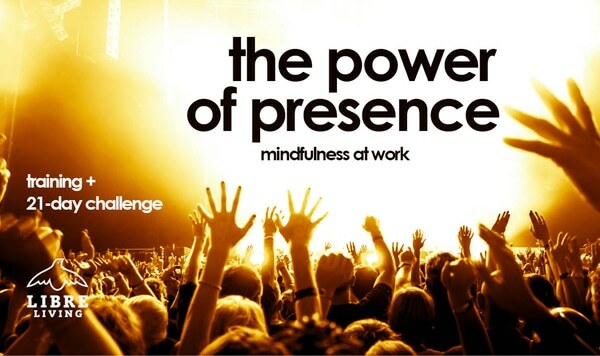 The Power of Presence training introduces busy working professionals to the concept of mindfulness in a way that’s accessible and fun. We talk about what mindfulness is, why it works and teach employees 5 Power of Presence tools that can be used during their busy workday. So they can access the power of presence, and the many benefits that come with it. This is a power-packed training with lots of ready-to-implement take-aways. I’m the founder of Libre Living Inc. and have taught mindfulness techniques at companies and universities including the University of British Columbia, Simon Fraser University, and SAP Labs Canada. Over 1,766 people have participated in my Libre Living programs, including the 30-Day Challenges. Your people have done the training, now they need support and help to implement what they’ve learned. Each day for 21 days a daily Power of Presence challenge arrives in their inbox. A simple and straightforward action for them to take each day to put their training into practice. Transforming their workday from one filled with stress and overwhelm to one filled with the power of presence. A review of the key terms and ideas plus action-steps to get them to see how each term and idea relates to their daily life. A review and re-introduction to the key mindfulness tools your staff learn in their training. Implementation of the tools into the areas they need them most. A process to establish mindfulness and the Power of Presence as a habit instead of a passing idea. Noticing how this new habit impacts their daily life, so they are encouraged to continue.